"Fillets of red snapper are coated with a mixture of pepper and herbs, then cooked at high heat until the coating blackens. Spicy and delicious!" In a small bowl, mix together paprika, cayenne pepper, white pepper, black pepper, salt, onion powder, garlic powder, thyme, and oregano. Dip fish into melted butter, and sprinkle each fillet generously with the seasoning mixture. Place the fish fillets in the hot skillet. Pour 1 tablespoon of butter over each fillet. Cook until the coating on the underside of the fillet turns black, 3 to 5 minutes. Turn the fish over. 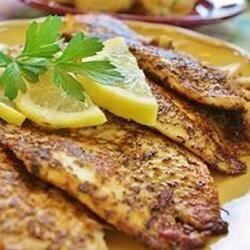 Pour another tablespoon of butter over the fish, and cook for 2 minutes, or until fish flakes easily with a fork. This was pretty good. I used it on fresh Tilapia fillets since I couldn't find red snapper. Using a cast iron skillet works great. This recipe is super fast and easy! My husband and I loved the wonderful flavor. The only downside is that it smokes- a lot. Little to spicy, lessen cayyene pepper for perfect taste. Next time I wont be quite so generous with the sprinkling of the spices, it was HOT! It was absolutely DELICIOUS though!!!!!!!!!!! Highly recommend this recipe!